Our Colour explosion/colour run is getting closer by the day. It is really important that EVERY CHILD has an online profile page. This is where you record the cash and online donations and it is also where you will need to select the prizes at the end of the colour run. Please get on board and support the P&F in their fundraising efforts. Much of the money raised will go towards shade projects at both campuses and some of the money will be donated to Project Compassion. Next Friday we will be celebrating de Vialar House Day. The following arrangements for the day have been set. 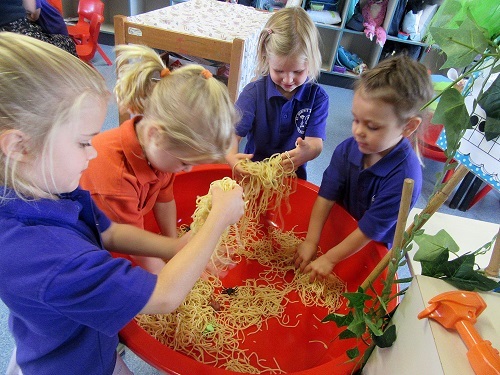 Primary Campus – Children are allowed to dress in yellow in return for a gold coin donation. There will be an Assembly at 8:50am in the Undercover Area. Secondary Campus - For the last eighteen months, due to behaviour issues associated with dressing up, the Secondary students have not been allowed to dress in the colour of the House that day. However, the request from the students to give them another opportunity has been heard and we are going to give them another go at getting into the spirit of the day. They will be allowed to come dressed in YELLOW clothing. However, please note that this is not a free dress day. Those choosing to dress up must make an effort to be in yellow and bring a gold coin donation. Those choosing not to dress up must wear their regular school uniform. There will be an Assembly at 11:00am in the PB Kirby Parish Hall. The installation of the new Pre-Primary classrooms is almost complete. The paving is finished and there is just some electrical work to complete and some minor landscaping. We are hoping to take possession of the building by the end of next week. Congratulations to our Secondary students who represented the School so well at the tennis tournaments this week. We achieved some great results and some excellent feedback about the behaviour of our students. Thank you to Mr Vernede for the training and Mrs Parnham who accompanied them. Martina, a class teacher at Bishop Epalle Catholic School in Nggosi West Honiara, enjoys clapping and singing with the children in her classroom. She knows they are not just having fun but learning life-saving skills. The children have learnt four songs including the ‘flood song’ which is sung to the tune of “This is the Day that the Lord has Made”. Whenever they sing, the melodies can be heard far and wide. Martina said singing with the children is her favourite part of the school day. It also serves an important purpose. Caritas Australia’s Disaster Risk Management project in this school, much like dozens in the Solomon Islands and Vanuatu, aims to get teachers to help young children learn strategies to be safe during disasters and emergencies. Using well-known tunes and simple lyrics, children learn what to do in the event of potential disasters that face the Solomon Islands such as cyclones, floods, earthquakes and tsunamis. The children and their families live in a vulnerable situation, with their lives and homes constantly under threat. So far the program has been run in 35 kindergarten and primary schools across the Solomon Islands. In Vanuatu it has been implemented in 22 schools targeting children from the age of 4 to 12 years old. Due to its success and interest across the South Pacific, Caritas Australia is planning to extend the program’s reach to other countries. “This season we’re better prepared and know how to respond, and in an emergency this can make all the difference,” said Martina. Please donate to Project Compassion 2019. Lives change when we all give 100%. 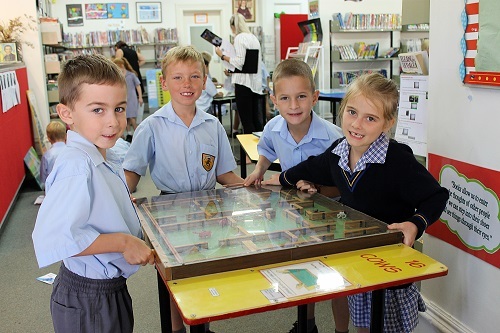 On Monday and Tuesday this week the Primary students were privileged to have the ‘World of Maths’ Incursion come to the School. 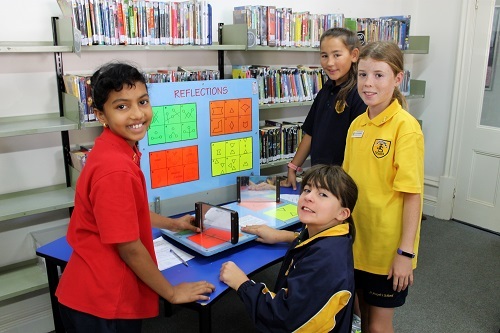 The Library was abuzz with conversation around maths problems as students solved up to seventeen interactive maths activities. 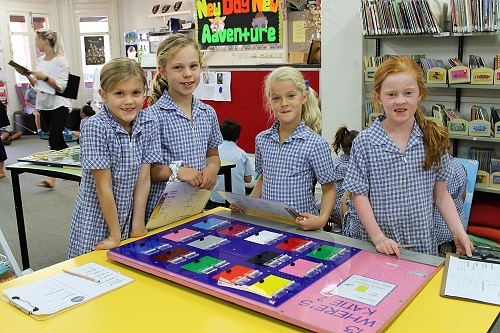 The incursion was designed to promote mathematics in a fun, colourful and hands-on way. Our presenter, Phil, even provided ‘brain food’ for some students! Well done to all our students for the positive behaviour and attitude throughout the sessions. I would like to wish all those students selected to represent our School at the NSSA Swimming Carnival next Wednesday 3 April the very best. Thank you to Ms Carrie Frost for organising this great event. On Friday 5 April we will be celebrating de Vialar House Day. This is a wonderful day that highlights one of our founders, St Emilie de Vialar. 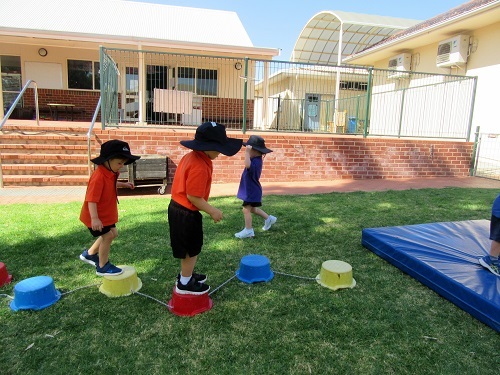 The students on the Primary Campus are invited to wear ‘yellow’ clothes and bring a gold coin donation. All the money raised will go towards Project Compassion. The Year 3 students will start our day of celebration by hosting the Assembly which will begin at 8:50am in the Undercover Area. But it was all okay as that day, we put Humpty Dumpty together again, with bandaids! 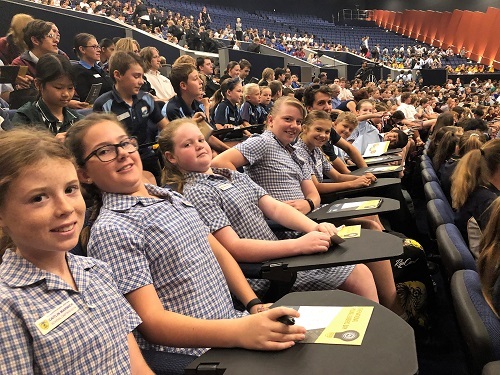 The Primary Student Leaders had a day out on Monday 25 March attending the National Young Leaders’ Day in Perth. We heard from famous Australians, explaining some of their experiences which helped them become good leaders. Leisel Jones spoke about how she listened and helped her teammates. I found this a really engaging story. We all had an enjoyable day and would like to thank Mrs Woodgate and Mr Hewitt for the opportunity. As the end of term looms, Secondary teachers are busy compiling the Interim Reports. These will be available in SEQTA from Tuesday 2 April and the last of the hard-copy reports will be posted. Make sure to secure your interviews times through the portal on the school website as mentioned in the beginning of this newsletter. 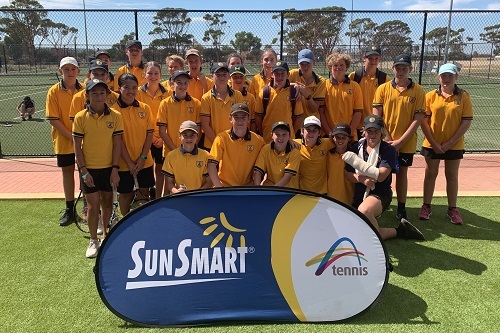 I was privileged to take a group of young girls to Robinson Park for the Sun Smart Tennis competition on Monday this week. The girls put up a good fight against some of the elite Tennis Academy schools, but sadly, they were defeated in the overall competition. Congratulations for making it into the finals! We will try again next year. On Tuesday this week our Principal, Mrs Woodgate, took a group of Year 12 students for Physical Education Studies at the Rec Centre for a game of Netball. The students were delighted to have the opportunity to get to know her and see some hidden talents. I encourage all students to continue to work hard even though the end of term is coming. Remember: the hard work you put in will be rewarded! 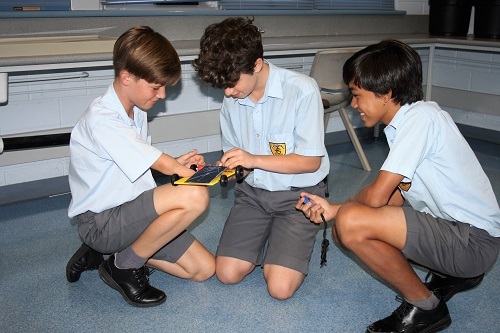 The Years 7 and 8 students started the year with Geography, covering basic mapping skills. They have then delved into their content studies. The Year 7’s have been investigating ‘Water in the World’ and the Year 8’s have been working through the topic ‘Landscapes & Landforms’. 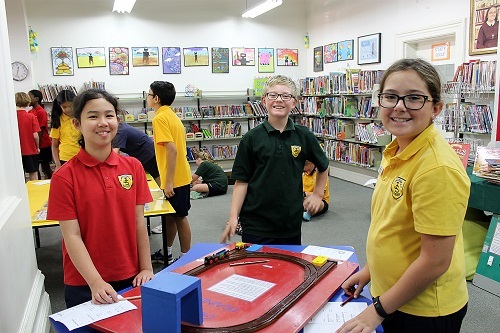 The Year 9’s have started with studying History, learning information about Imperialism, the Industrial Revolution and European settlement in Australia. 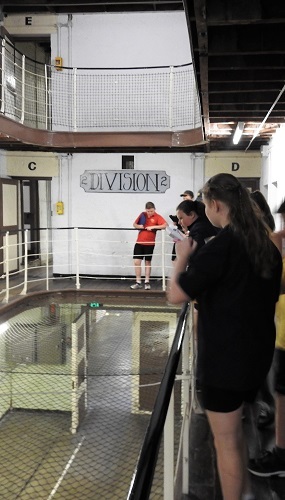 To support their studies, students ventured on an excursion to the Fremantle Prison, learning about the experiences of convicts in Western Australia. They have improved on their source analysis skills and will soon be working on their essay-writing skills during their studies of the causes, events and impacts of World War One. The Year 10’s are currently studying a variety of sub-topics within the overarching theme of ‘Environmental Change and Management’. 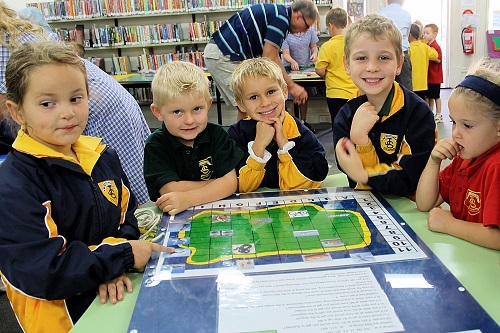 Before this focus, they worked on their mapping skills to develop a solid foundation for those who may choose to study Years 11 and 12 ATAR Geography. 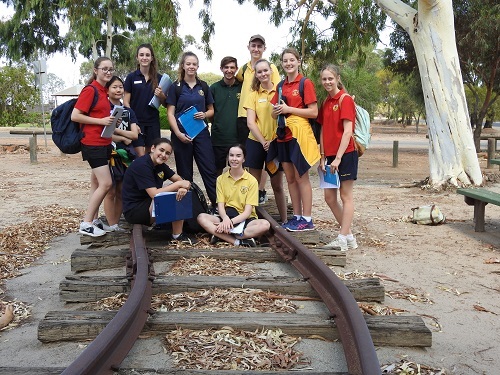 The ATAR Geography Year 11’s have just recently been on an excursion to sites around Meckering and the Cunderdin Museum, to investigate the 1968 Meckering Earthquake. This is part of their first depth study on ‘Hazards’. Prior to this depth study, the students covered mapping skills and an overview of information about hazards. The ATAR Geography Year 12’s started their studies investigating environmental change with overview content on the topic of ‘Land Cover Change’ and geographical skills. 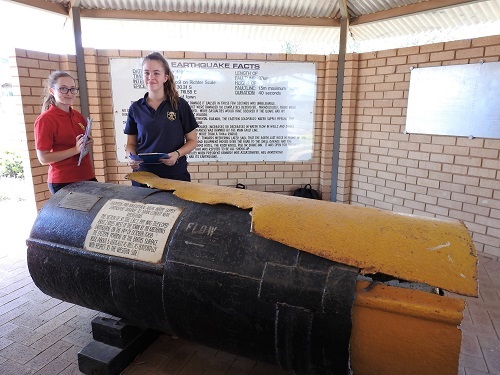 They are currently working through their first depth study focused on ‘Climate Change’ and will then complete their second depth study ‘Investigating Land Cover Change & Management’. The Year 12’s will then study ‘Planning Sustainable Studies’, again with overview information and two depth studies. These depth studies will be Perth and New York. 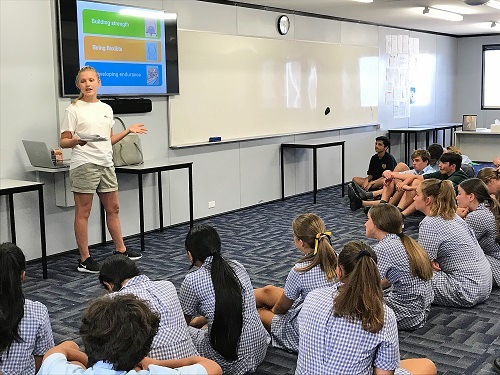 This week, the Black Dog Institute came to talk to the Year 9 Health students about mental health, body image and the impact of media on young people’s self-esteem. The students learnt about the importance of self-care strategies, brain training, mental fitness and how to recognise mental health challenges. Thank you to The Black Dog Institute and well done to all students involved. This was a great opportunity for St Joseph’s students to learn more about mental health and the challenges they may face as young people in our community. 3rd: Shayla Dunstan - Cauliflower puree with roast cauliflower cheese and lamb. 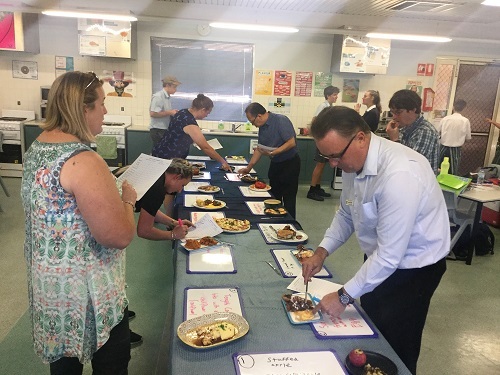 The judges were very impressed with the presentation and tastiness of each of the dishes prepared and thoroughly enjoyed their testing experiences. The Herbert Edwards Cup started with some joy when the junior girls team (Chelsea, Zsavinah, Keely and Antoinette) qualified for our region in Cunderdin on 14 March. Now that we had qualified, all the players attended at Robertson Park Tennis Centre in North Perth on 25 March. We played many different schools from WA in a fast, fun format. The Junior girls team beat Shenton College with some players winning their matches against some of the other schools. It was an enjoyable day with some ups and downs but it was a great learning experience for all the players. We can’t wait to do it again next year. Next week, there are a number of inter-school academic challenges occurring. 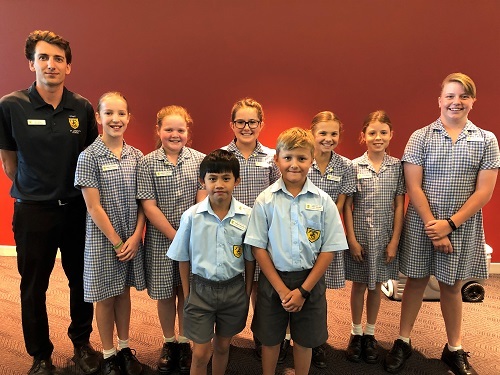 A group of Year 6 students; Sebastian Rutter, Rohan Smith, Ceri Rose and Georgie Hammarquist along with a group of Year 8 students; Adrian Gargano, Ashton Stewart, Fred Ochtman and Kyran Reyes will be participating in the annual Synergy Solar Car Challenge. 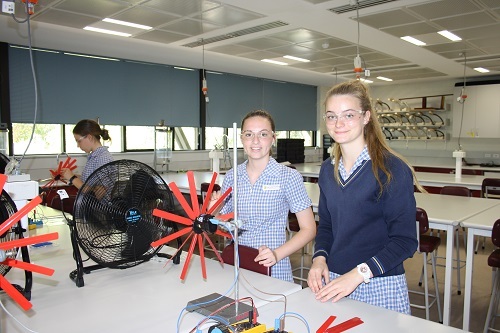 In preparation for this event, both groups have been working very hard over the last month with designing and testing of their vehicles and are feeling very positive about the Eastern Metropolitan heat at Mazenod College on Tuesday. “This is my second year doing the Synergy Solar Car Challenge, I have enjoyed the lead up to the 2019 challenge with all the practice sessions. Next week also sees the Secondary da Vinci Decathlon events occurring for the first time at Winthrop Hall at the University of Western Australia. 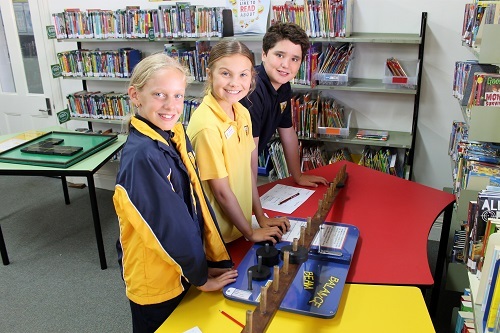 Each team of eight students have been training throughout the term in the after-school da Vinci Club. 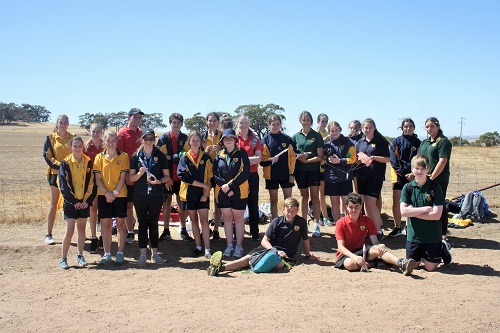 On Tuesday 2 April, the Years 7 and 8 students are competing and on Wednesday 3 April the Years 9, 10 and for the first time in WA (as this a National event) Year 11 events. We wish all our students the best for these inter-school academic competitions. 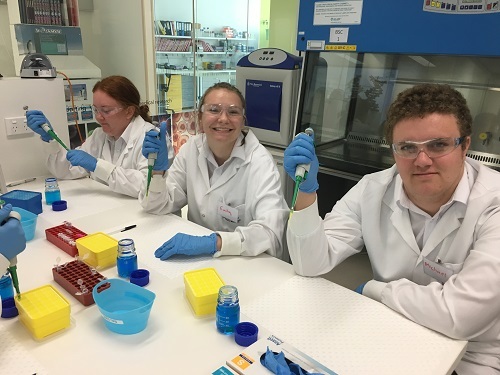 On Monday 25 March the Year 12 Biology class travelled to the Perkins Institute Biodiscovery Centre. 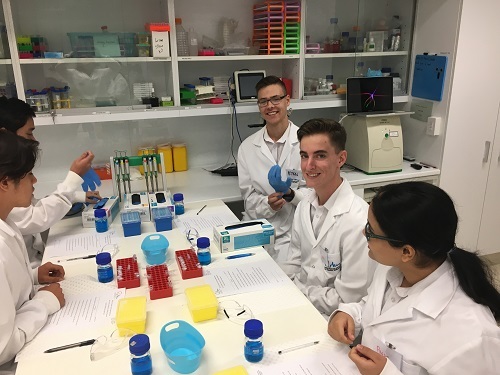 The students discovered how to amplify a human gene with Polymerase Chain Reaction (PCR), visualise the product with gel electrophoresis and identify mutations with gene sequencing. Our class was able to speak to research scientists and use research grade equipment. 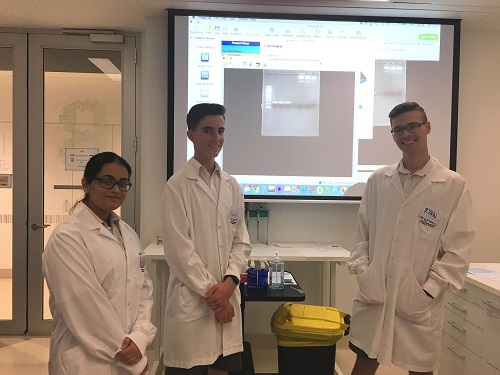 Students were also able to investigate the mutated BRAF gene of three patients and how the identification of this mutation can lead to improved treatment options for people with melanoma. 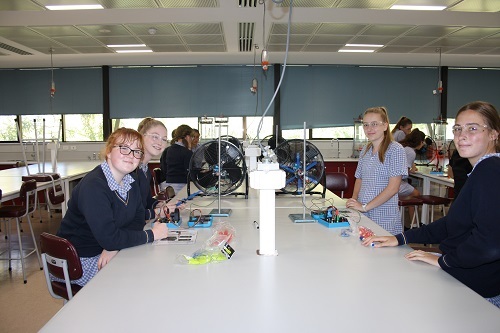 Young women from our Year 10 course A Science class were invited to attend the WISE women conference at Murdoch University on Wednesday 27 March. 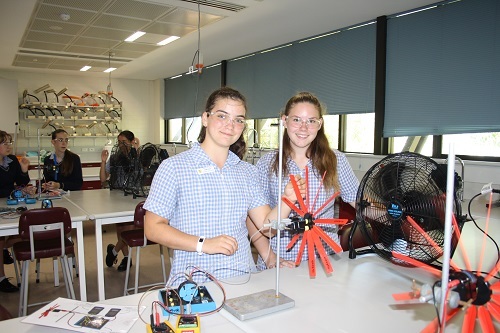 This fantastic opportunity was designed to demystify STEM careers available for young women in Australia. The day began with a keynote address from Grace Gilmore, a research Medical Scientist who specialises in Haematology. Students learnt about the key role platelets have in blood clotting and coagulation. 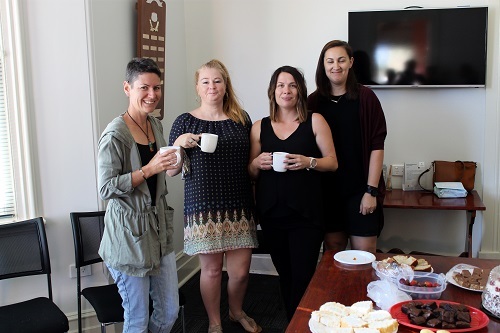 We were able to see the far reaching benefits of research being done in Perth and how it can help others all around the world. The students were then able to attend two hands on workshops. The showcase finished with a fantastic Q & A session with three scientists from different areas and stages within their careers. The speakers included a Civil Engineer, a Lecturer in Environmental and Conservation Sciences and a second year university student who had moved from a regional area. These three accomplished women spoke to the students about how a degree in STEM can open so many opportunists for young women. For example, a degree in Engineering can lead jobs that involve travel to amazing countries, publishing and community engagement. Our students were also interested in quizzing the university student on what life at university was like when moving from a regional area and how she maintained her work life balance. Overall the day encouraged our young women to think outside the box and apply science to make a real difference in the world. components of a wind turbine, how angles affect productivity and got to experiment with different blade lengths. At Murdoch University one of our hands on tasks was to reconstruct facial muscles. We used clay to mound on a skull where the muscles are. We also learned about the purpose of each muscle, as well as distinguish the different features of race and gender for forensics. We also learned a bit about how scientists complete this task which usually takes around 18 months. 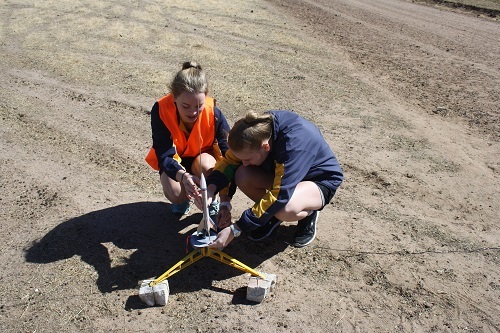 On Monday the 25 March the Year 10 course A Science class travelled to Burlong Farm to launch rockets students had carefully constructed in class the week before. We tested 5 different classes of motors to record data that will lead to statistics being generated relating to acceleration, velocity, Force, Energy, momentum and, of course, maximum altitude. 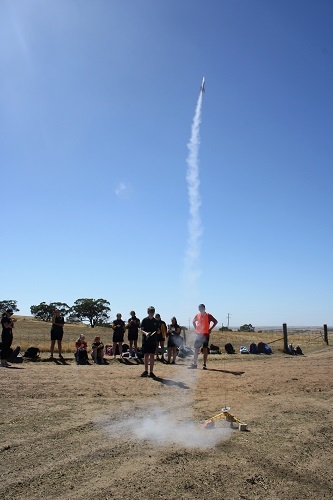 One of our rockets even travelled to a maximum altitude of 386.34 metres! 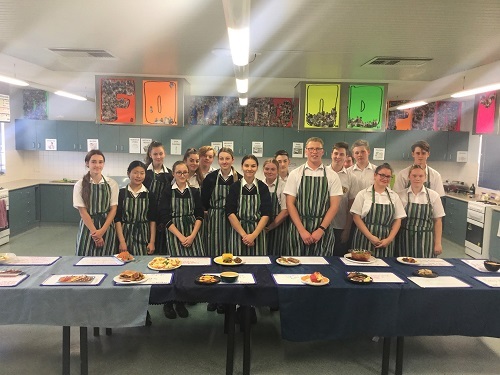 On Thursday 14 March, 26 Secondary students from Years 7 to 11 represented St Joseph’s School in 6 teams at the annual Central Districts zone competition of the Herbert Edwards Cup/Mursell Shield. All teams represented St Joseph’s in an exemplary manner, competing in quality tennis matches throughout the day. Some performances were particularly outstanding. At the conclusion of the day, we were announced as winners of the boys and girls Herbert Edwards (Years 7-9) competition. 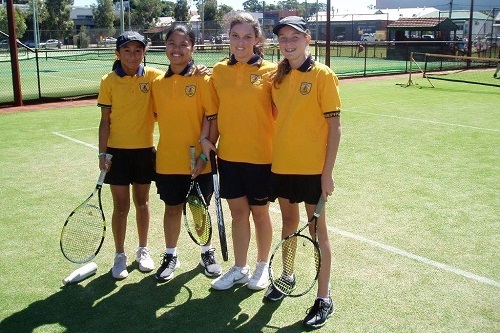 On 25 March, our winning girls’ team (Antoinette Matres, Zsavinah Teodoro, Kealey Goldson and Chelsea Harries) competed in the State Finals at Robertson Park Tennis Club in Perth. The girls competed strongly all day and should be proud of their efforts. Thank you to Mrs Parnham for her work with the team on the day. 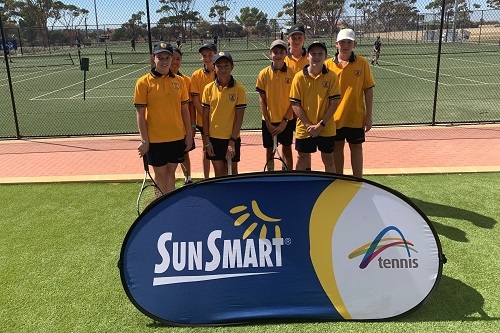 On 26 March, the winning boys’ team (Pietro Vero, Corey Childs, Isaac Childs, Aiden O’Driscoll and Loch Mactaggart) competed in the State Finals, also at Robertson Park Tennis Club in Perth. The boys displayed a high standard of tennis. Some great results were achieved throughout the day, but ultimately, the boys were eliminated in the first round of finals as the girls were a day earlier. Well done to our participants throughout all the tennis competition! Following a busy week full of classes, off-campus activities and competitions, the final placings for the Inter-house Swimming Carnival were determined and we would like to announce the results from the Inter-house Swimming Carnival held on Thursday 14 March. Congratulations to the winning House in each category and we thank all our students who participated at the Carnival. The information below contains the key information that you will need for the last day of this term when we hold our fundraiser, “The Colour Explosion”. Friday 12 April on the oval at the Primary Campus. Pre K-Year 1: 12:30pm - 1:10pm. Students who have NO older siblings will be allowed to be signed out to go home. Those with older siblings will need to return to class until their siblings have finished their colour run. Year 2-Year 12: 1:30pm -2:45pm. ALL students will be dismissed from the Primary campus. We ask that parents with older students arrive after 3:15pm to pick them up in order to allow the younger students to leave safely. 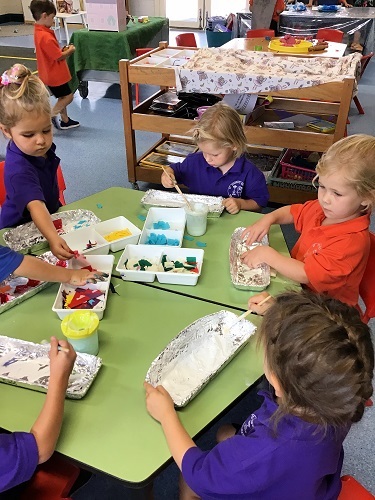 All students are to wear their sports uniform to school that day and bring a change of clothes for participation in the colour run. 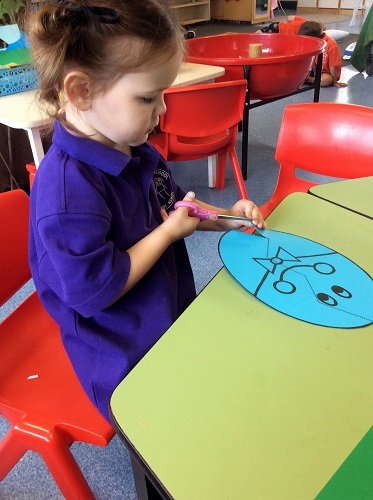 They are able to get changed at lunchtime. During the colour run, students are encouraged to wear old clothes and a white or light coloured t-shirt. This makes it fun as they see themselves full of colour. However, the white t-shirt is not compulsory. Those students catching the bus home MUST CHANGE before getting on their bus. For students travelling home with their parents, it is at the parents’ discretion as to whether their child needs to get changed. Each child needs to have their own online fundraising page with a code supplied at the front of the fundraising book that was sent home. This page allows you to share a link with family and friends for fundraising and it is required in order to claim and choose prizes. This is required even for those who are collecting cash donations. 75% of the profit made will go to the P&F who are helping to supply some more shaded areas at both campuses. 25% of the profits will be donated to Caritas Australia and their Project Compassion Appeal. If you have any concerns or have trouble doing this, please contact me via email: georgiahaddrill@gmail.com or mobile 0439 9429 33 and I will help you set it up. Donations are starting to come in for the popular Easter Egg Raffle with ticket sales starting Friday 5 April for the last week of term. This will be drawn on Thursday 11 April (prizes to be collected on the day of the Colour Run). Last year, 93 prizes were distributed to students across both campuses and was very well received by all. A percentage of money raised will be donated to our School's charity for this term which is Project Compassion. We hope to make up as many prizes as possible and are asking for any donations to come forward from now until the last week of term - please drop to either the Admin Offices or classrooms. Donations can be chocolate, colouring books, mugs, craft, baskets, bags, etc. etc. We appreciate your contributions and support. 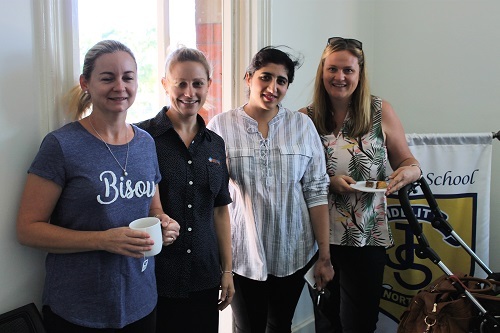 Today, the P&F held the first morning tea for our Pre Primary parents. Thank you to the parents that were able to attend and also to those that supplied the yummy treats to share. 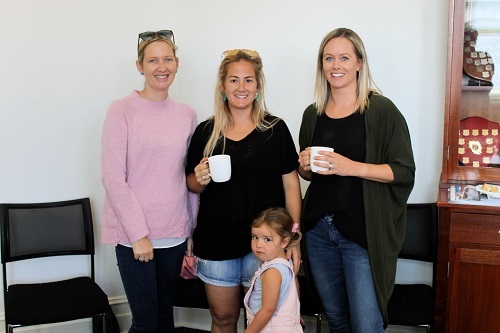 In Term 2, we will be holding a morning tea for the Kindergarten parents on Friday 31 May and on Thursday 27 June for the Pre-Kindergarten parents. We hope to see you there. Our next meeting is on Thursday 4 April at 1.00pm in the Primary Library. This will be to finalise everything for the Colour Explosion and Easter Egg Raffle. Remember 'many hands make light work'. Northam Dental Therapy Centre advises that it will be closed from Wednesday 3 April to Friday 5 April and reopening on Monday 8 April 2019. During the April School holidays, the clinic will be closed from Friday 19 April to Friday 26 April 2019 and reopening Monday 29 April 2019. In urgent cases, please contact phone 0458 644 530 or 08 9313 0552 or 0437 202 882 for assistance or your private dentist. For afterhours emergency only call 1800 098 818. 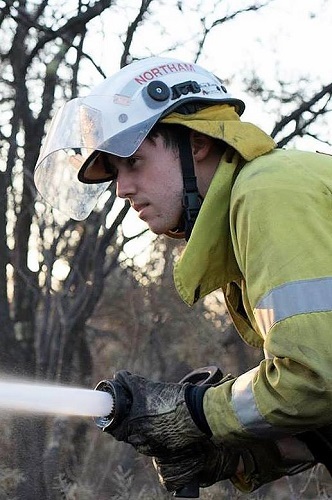 The Northam Volunteer Fire & Rescue Service is holding their annual Open Day on Saturday 6 April at the Northam Fire Station on Wellington Street. Commencing at 10.00am is the opportunity for all to come and have a look at the fire service vehicles with plenty of activities for the kids to do. At 11.30am there will be a presentation on joining the Volunteer Service. From 12 noon, everyone is invited to share a free BBQ with icecreams for all the kids attending. Do you have a daughter/s aged 5-17yrs? Do they like to have fun and enjoy making long-time friendships? 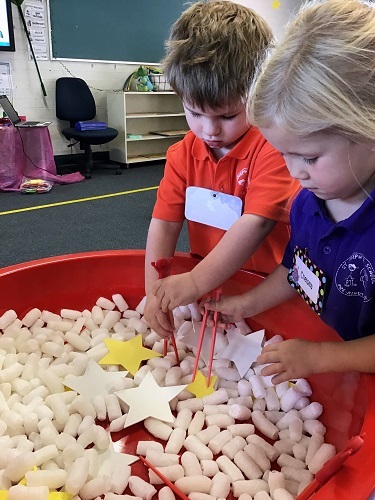 Would you like them to engage in confident building and hands-on learning, based on their own interests? Northam Girl Guides will be back up and running for Term 2. This will be a revamp of the old Unit with new leaders and old and new members and will be held on Wednesday afternoons from 4.30-6pm at the Northam Guide Hall. 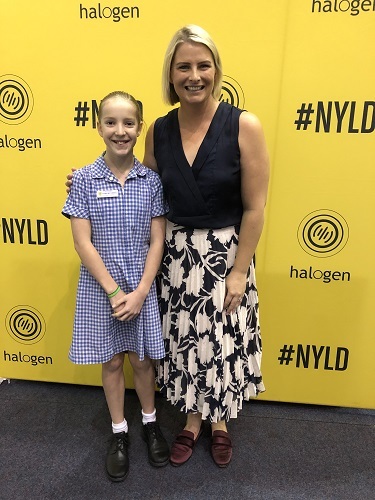 Hi, my name is Sarah and I’m a mother of 4 daughters aged 11 down to 4yrs and I’ll be running the Northam Girl Guide Unit. I was a young Girl Guide myself back when I was 11 and enjoyed every minute of it. The camps, pushing myself to always do better, practical skills, serving my community and most of all, the friendships. We are looking at taking membership enquiries for next term. We have limited spaces for each age groups. Ages 5-8, 9-12 and 13-17. We need more leaders or assistant leaders in our Unit as more leaders mean more girls we can take. These can be mothers, aunts, grandmothers or any female that can obtain a WWC check. Volunteering with Guides is rewarding and fun. There will also be a guardian/parent helper roster and as a part of your child’s membership you will be expected to help out from time to time - don’t worry it is easy and super fun. We are currently recruiting children of all ages to participate in the Mundaring Winter Basketball Season beginning 30 April. We are a club dedicated to enabling all children, regardless of age, ability or skill the chance to participate and play the sport they love or the opportunity to try something new. Our mission is to develop them in skill and socially, encouraging them to have self confidence and trust in their team mates. We work closely with our coaching team assisting them throughout the season and pride ourselves in the relationships we have and continue to build throughout the community. We hope to see some of you at our upcoming Registration Day on Sunday 7 April at Chidlow Hall, between 1.00-2.00pm.